Eveready 228, 304116, A228, Alkaline replacement for Eveready Mercury and Carbon Zinc original batteries. Battery equivalent to Rayovac 1810, NEDA 1810. Type: Alkaline (replacement for original Carbon-Zinc). Voltage: 12 V.
Length: 64 mm. (57 mm without snaps). Diameter: 26 mm. Price: £14.45 each. £13.99 each if you buy two or more. Postage and packing included. Also replaces: Eveready 228 (12.0V), Eveready 431 (11.2V), 304116 (12.6V). The original carbon-Zinc Energizer or Eveready No. 228 (NEDA 1810) was occasionally deployed in industrial applications. 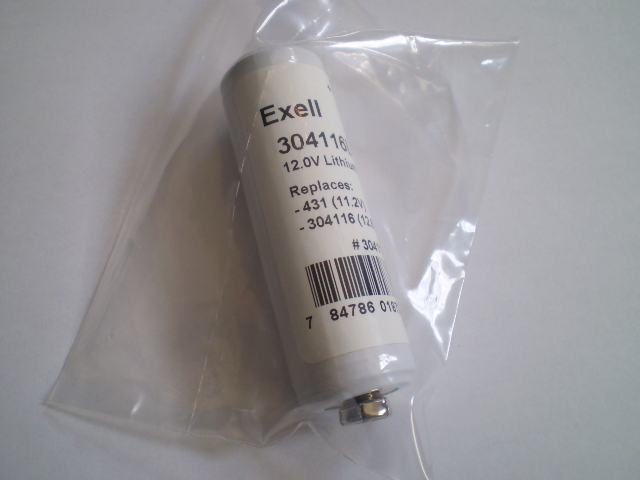 This now rare small cylinder battery has a snap at each end and often replaced the Mercuric Oxide Eveready 304116 or 431. The Energizer 228, 304116 or 431 was once very popular for use in scientific equipment. Our 228 battery is an alkaline replacement that faithfully reproduces the dimensions and voltage of the original, breathing new life into countless pieces of vintage equipment. This 228 battery is slightly shorter than the mercuric oxide 431 and 12.6 volt which allows it to comfortably substitute for them. Our 228 battery has a voltage of 12V which cleverly allows it to substitute for the 12.0 volt 228, the 11.2 volt 431 and 12.6 volt 304116 versions of the original battery. These A228 (or NEDA 1810 or 304116 or 431) batteries have a shelf life in excess of about 5 years. Why not buy two or more packs, take advantage of our reduced price and make sure you are not left unable to use your piece of specialist equipment next time your battery runs out.